For many, many years there has existed a garden that is immeasurably near. the garden. Not because the animals are bad or want to harm the fairies. find a safe place where they can live in peace. when stormy winds shook the flower once in a while. ground, the goblins could tease them and play mean tricks on them. people who cannot bear the thought of others being happy. yew sap. It was a difficult task for the little fairies, but well worth it. loudly. 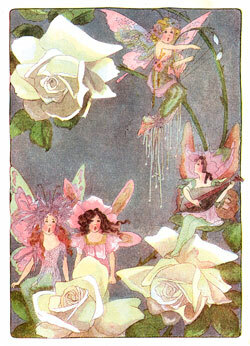 From that day on they left the rose fairies in peace. still possible to find a little fairy between the petals. Let her sleep in peace then.